A new health breakthrough has found why statins, among the most commonly prescribed drugs in the world, are a hidden cause of muscle pain. Researchers found that as many as three-quarters of people who take the drugs to lower cholesterol may suffer this discomfort. Statins are the go-to drug class for people who have a high cholesterol level, which puts them at risk of heart disease. Danish researchers have discovered what could be causing statins to trigger such muscle pain. Their study appears currently in the Journal of American College of Cardiology. Statins work by stopping the liver’s ability to produce cholesterol. They are the most effective, most potent medications around for lowering LDL (“bad”) cholesterol, and about 30% of adults wind up taking them. The likelihood rises as you grow older. A well-known side effect of statin therapy is muscle pain, and up to 75% of patients (who are physically active) who take such drugs experience that pain. The discomfort can prevent people from taking their medicine or from exercising, which are both problematic. The new study shows that statin drugs affect how your muscles produce energy. This theory is driving the idea that statins cause muscle weakness and pain in patients. The study also showed that the patients taking statins had low levels of one key protein: Q10. When Q10 is depleted, there is lower energy production in the muscles, and this could be the trigger for muscle pain that wouldn’t have happened if people weren’t on statin therapy. There is an interesting note in all this, an undercurrent of thought about whether certain people should take statins at all. The drugs may be of only marginal benefit. An older literature review had found a 0.5% drop in all-cause deaths. This means that for every 200 patients taking statins daily for five years, one death would be prevented. So, if the drug causes significant side effects and puts a burden on quality of life, should it be taken at all? Perhaps there are natural ways to lower cholesterol that don’t carry such painful side effects. On that note, here are nine ways that plants can lower cholesterol. 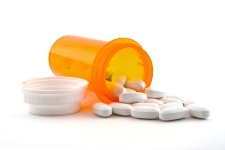 However, you should always talk to your doctor before discontinuing any medication, including statins. Larsen, S., et al., “Simvastatin Effects on Skeletal Muscle Relation to Decreased Mitochondrial Function and Glucose Intolerance,” J. Am. Coll. Cardiol. 2013; 61(1): 44-53.